Fiber Creations offers a multitude of stunning fiber optic Fiberstars products. 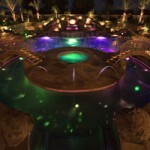 We offer things such as accent lighting for pools and spas, landscape design and hard to reach areas. Fiberstars products include star ceilings, a gorgeous way to make your home or business create a unique impression. Star Floor Kits are also a striking Fiberstars product to add to your pool or spa. Fiber Creations also offers laminar jets, sheer descents, rainfalls, waterfalls and many more Fiberstars products to give your pool or spa a look of irresistible perfection. If you can dream it, Fiber Creations can build it using Fiberstars products. When you contact Fiber Creations we offer custom assistance. We would like to talk to you to find out what is needed to bring your vision to life, so we offer a free consultation service to make sure you are getting exactly the products you need to bring light to your creation. You can order all the supplies you need directly through our company, so there is no need to go searching for each component. As a national distributor we offer several manufactures lines including Fiberstars products. So we can find the best product for your needs and budget.